Let’s be clear on one thing: a vehicle equipped with all-wheel drive provides an undeniable advantage during the winter season in Canada. The extra grip of such a system allows us to confront snowstorms and icy surfaces with more confidence, and we feel much more in control. That being said, an AWD car or truck isn’t a necessity. With a good set of winter tires, safe driving habits and good judgement, we can survive through our long harsh winters with too much worry. In addition, the added weight and friction of an all-wheel drivetrain should technically have an impact on fuel economy. Seeing the number of SUVs on our roads, it’s clear that we’re ready to spend more money and consume a little more fuel to obtain an AWD vehicle. The vast majority of manufacturers offer such utility vehicles, but very few sell AWD cars. And as we know, that’s Subaru’s speciality. With the upcoming retirement of the Chrysler 200, only the Ford Fusion will offer an optional AWD setup in the ultra-conservative midsize sedan segment. 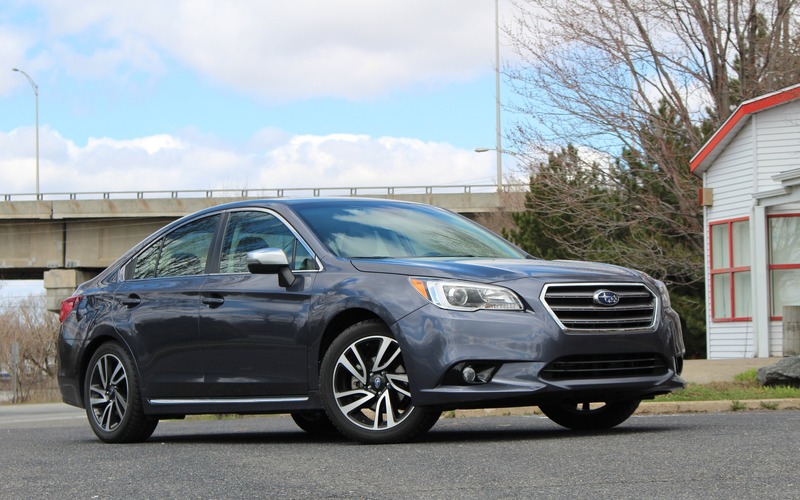 In the case of the 2017 Subaru Legacy, it’s standard on every trim level. And unlike reactive systems that wait until wheels slip to send power to all four wheels, Subaru’s all-wheel drivetrain is a full-time system. But is it an advantage? Yes, during winter. During its career of more than 25 years, the Legacy tried for a long time to be different from its rivals, Subaru knowing very well that it was illogical to compete with the Honda Accord, the Nissan Altima and the Toyota Camry by imitating them. The Legacy used to be a slightly smaller and more agile car, with its unique character. The brand’s loyalists seemed to have liked the first few generations of the Legacy, but these loyalists don’t make up a very large group. To gain market share, Subaru finally revised its strategy and created a bigger Legacy, along with a conservative design to attract customers that seem to find stylish cars repulsive. The 2017 Subaru Legacy, practically unchanged since its redesign for the 2015 model year, is more spacious than ever. Up front or in back, occupants will feel at ease on comfortable seats. Our test car, a Legacy 2.5i Sport, boasted cloth and simulated leather upholstery with blue contrast stitching. The overall look isn’t all that exciting, but tasteful nonetheless. We can say the same for the dashboard and door panels. Finish is good and so is the choice of materials, along with a restrained design. Once again, the brand is relying on conservatism that’s one of the main purchase criteria in this category. While a 6.2-inch screen is standard, our Sport version included the 7.0-inch screen upgrade. The latter is quite reactive to finger poking, which is good, but certain button zones could be bigger. In addition, Subaru’s STARLINK application suite with smartphone connectivity has few features. And no Apple CarPlay or Android Auto—although they will be added in the 2018 model-year Legacy. At least in the Limited versions, we’re allowed to a 576-watt, 12-speaker Harman Kardon sound system, but the price of these trim levels is more than $30,000. The Sport version also includes the company’s excellent EyeSight advanced safety driving aid suite. It features adaptive cruise control, autonomous emergency braking, lane change warning and prevention as well as automatic high beams. Blind spot monitoring with rear cross-traffic alert is also standard in Touring, Sport and Limited versions. The 2017 Subaru Legacy relies on a 2.5-litre, horizontally opposed four-cylinder engine that develops 175 horsepower. Base trims are offered with a six-speed manual transmission, but the vast majority of buyers will choose the continuously variable automatic. Obviously, during full-throttle acceleration, the engine can clearly be heard, but under normal driving conditions, it’s perfectly adapted to the car’s mission. A 3.6-litre six-cylinder engine that produces 256 horsepower is also available on upscale trims. As expected, it’s smoother and provides the Legacy with much more power, but its fuel consumption is about 2 L/100 km higher than with the four-cylinder mill. Speaking of which, behind the wheel of our Legacy 2.5i Sport, we recorded an average of 8.7 L/100 km. A good result considering the full-time AWD. In fact, the official city/highway figures are only about a half-litre more than the segment’s most efficient sedans, such as the Chevrolet Malibu, the Nissan Altima and the Honda Accord. 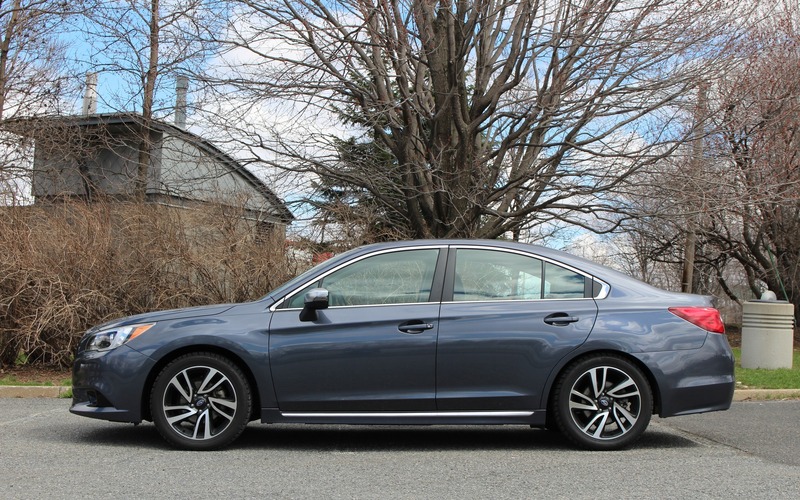 We liked the refined ride, the comfort and the quietness of the 2017 Subaru Legacy. Its road manners are pleasant, with a touch of sportiness, but the car tries in no way to be a sports sedan. So, for winter, the Legacy is a very interesting choice in its category. During the rest of the year, it’s a run-of-the-mill midsize sedan that has a hard time standing out. However, there’s no more refinement and fuel consumption compromises related to its AWD hardware. We just have to pay a slightly higher price, as a well-equipped Legacy will cost between $1,000 and $1,500 more than its equivalent adversaries.